Home » News » Specialty BIS in Erba, Italy by offspring Julius De la Parure. At the Special Premier 2014, the main Toy Dog Specialty of the year in Italy, in Erba (IT). 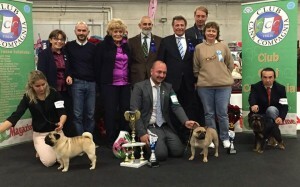 SBIS BIS Multi Group Winner Ch Perfect Lady of the Royal Way wins CAC and BOB under Mr Pietro Paolo Condò (IT) and then in the end of the day SPECIALTY BEST IN SHOW under Mr F. Asnaghi (IT). To our knowledge isthe first time a French Bulldog to win SBIS at this important event!Bred, handled, and co-owned by Mr Vincenzo Pontone (IT). Congrats with these excellent results and keep up the good work.